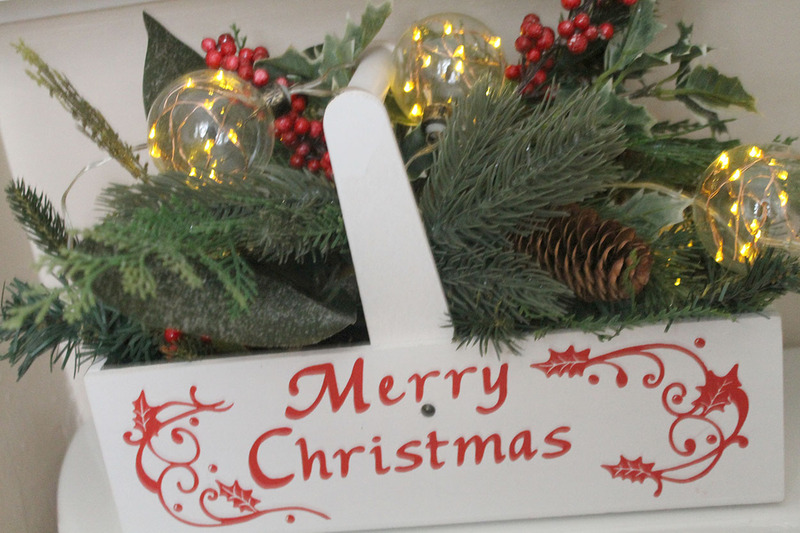 Thanks for following along with me this week, as I take you on a tour of our home and how I’ve decorated it for Christmas! If you’ve missed the previous two days, click here to see the entry and foyer AND here to see the dining room. Today is the kitchen…probably the room in which I spend the most amount of time! 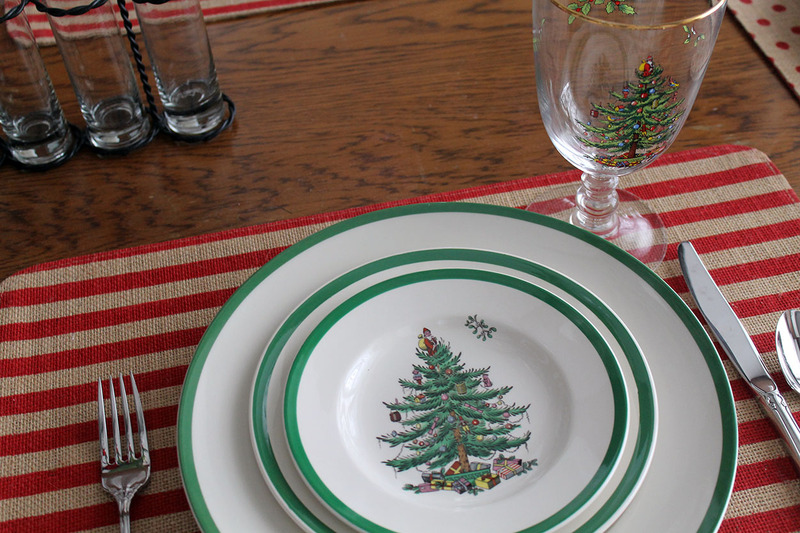 For that reason, I like to make it festive for the season…but not too cluttered since it IS the kitchen, after all. 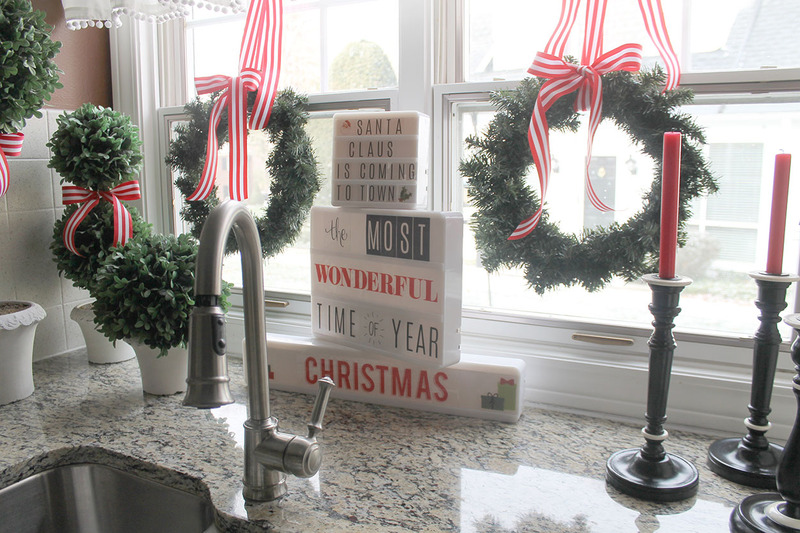 I love this area by my kitchen sink! 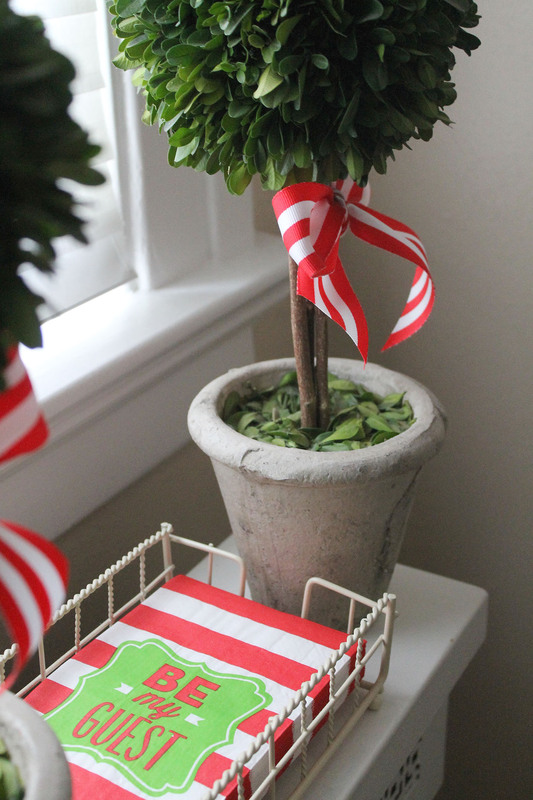 There is extra space, so it is a great place to decorate. 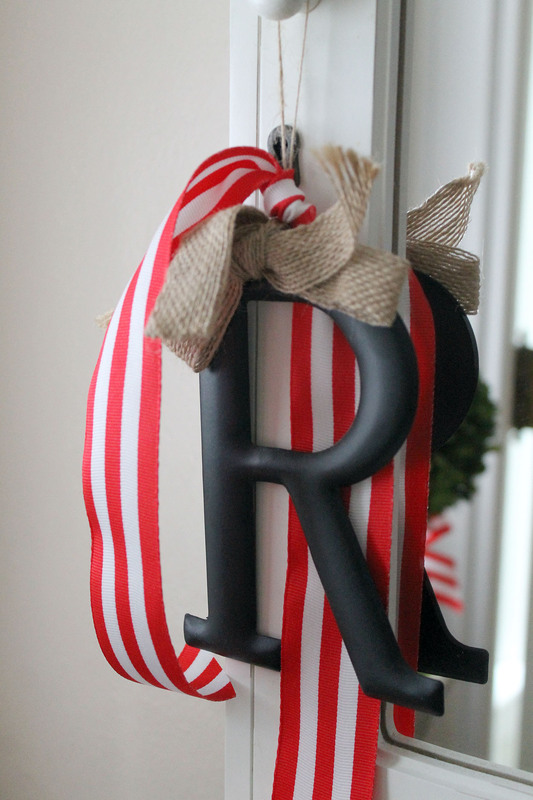 I hung small wreaths in the windows with that candy cane striped ribbon that I’m loving so much this year. 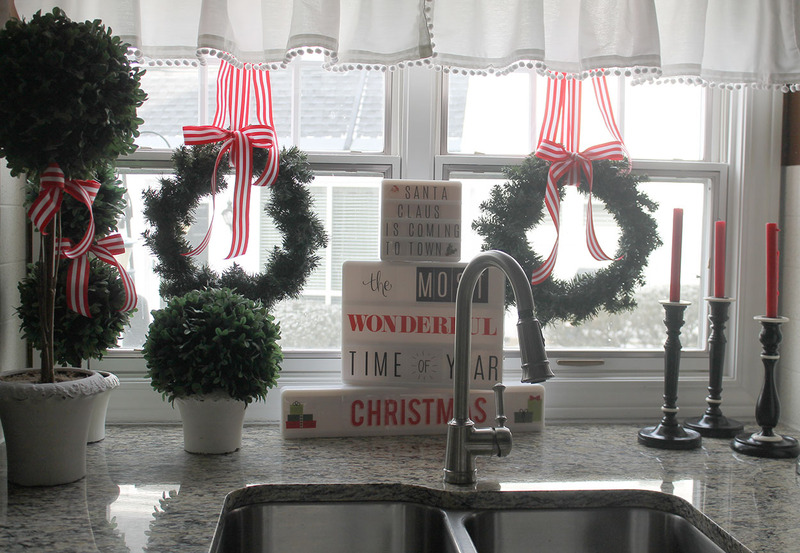 I tied extra ribbon on the topiaries, and added red candles to my candlesticks. 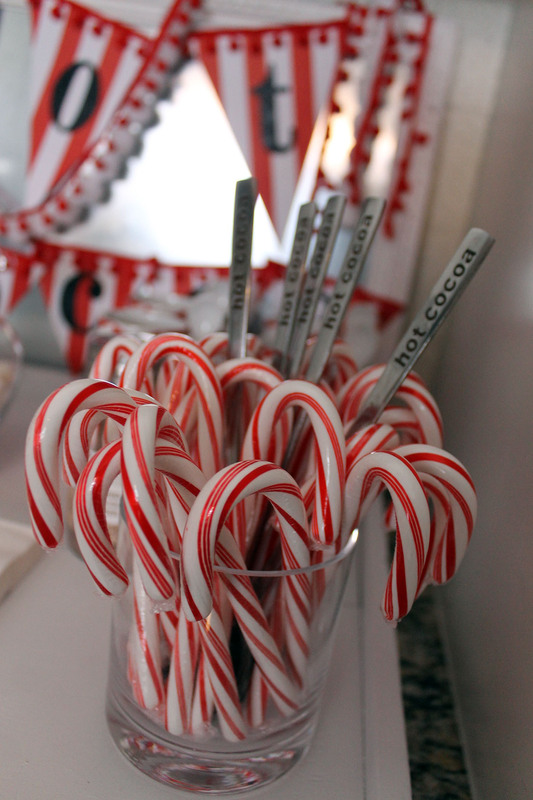 Red is just the perfect color this season! Across from the sink is this small counter area between my refrigerator and ovens. 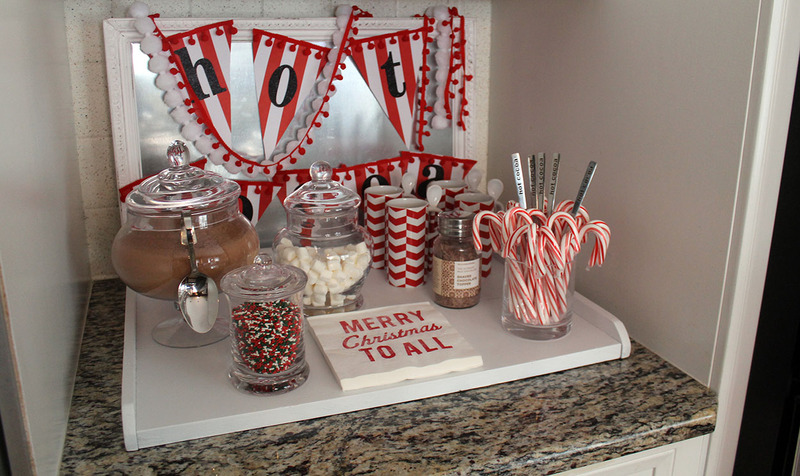 This time of year it makes the perfect space for a hot cocoa bar! 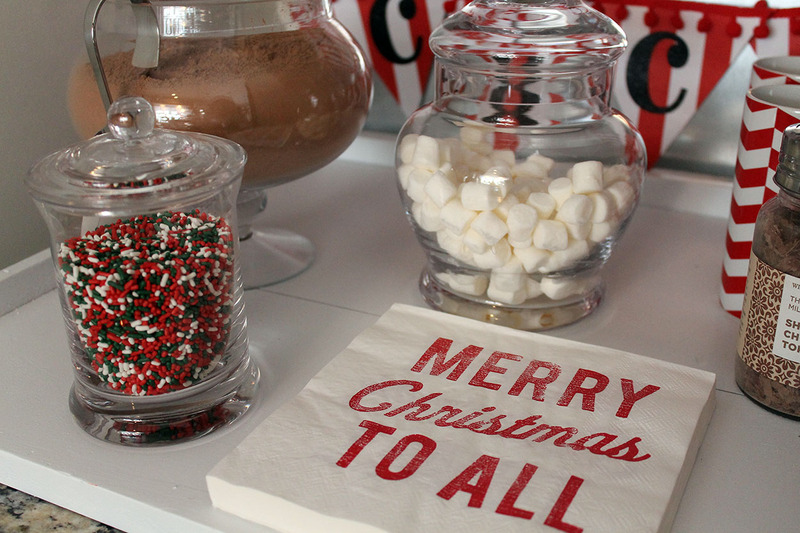 I set a tray of mugs, cocoa mix, marshmallows, sprinkles, and candy canes. 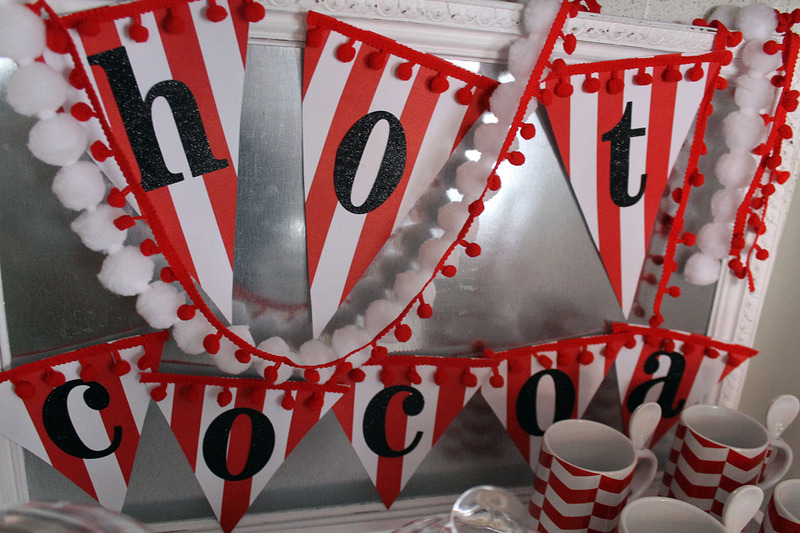 Not only does it look festive, but all the supplies are ready to fix a mug of warm chocolate goodness after coming in from the cold. 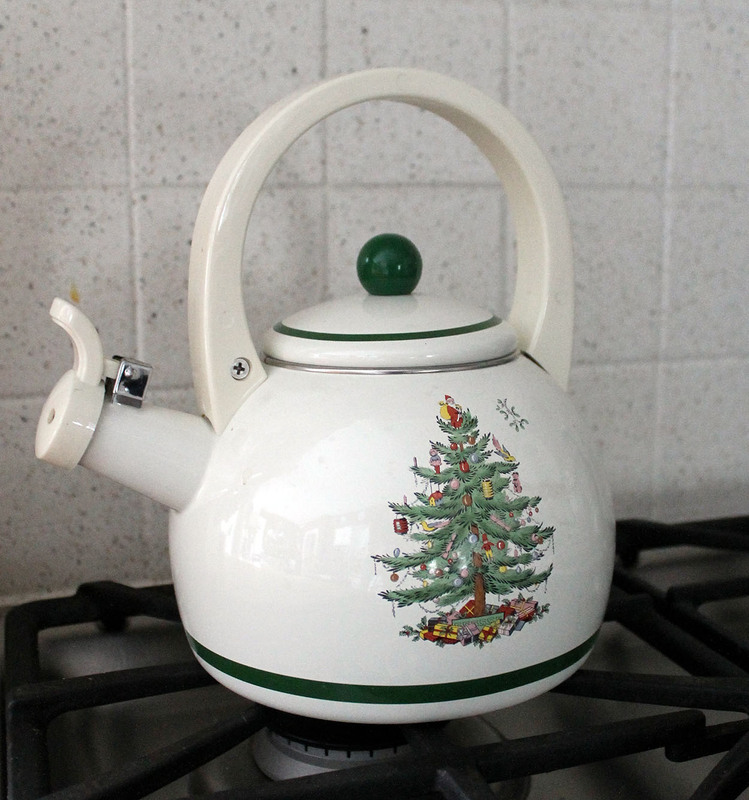 The Christmas teapot is ready and waiting on the stovetop…just add milk and heat! 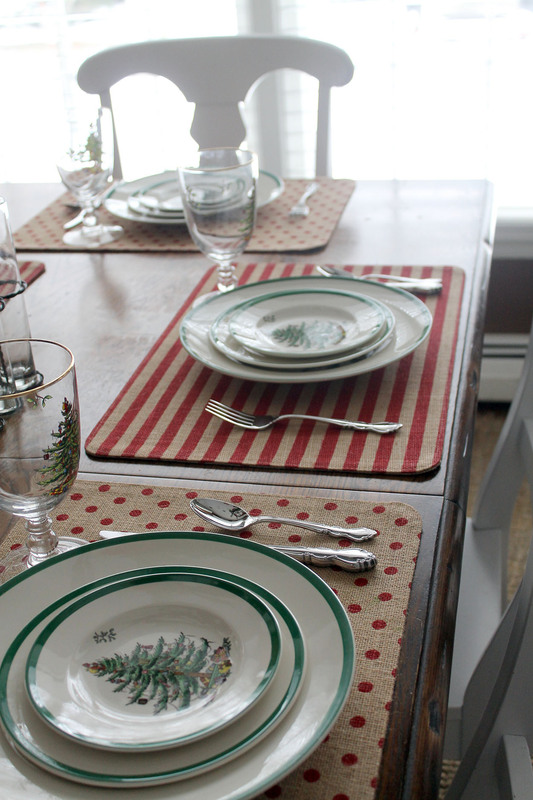 The kitchen table is a bit more fancy than usual. 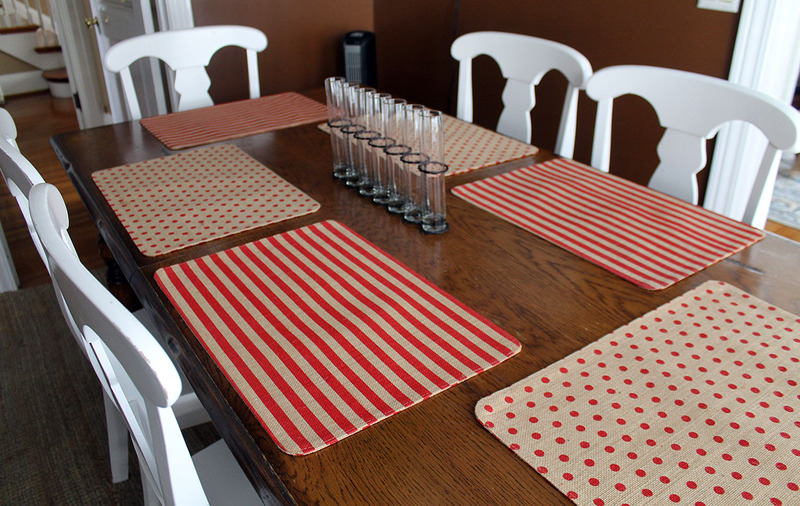 I found these great reservable placemats…striped on one side and polka dots on the other…that I’ve been using at all our meals. 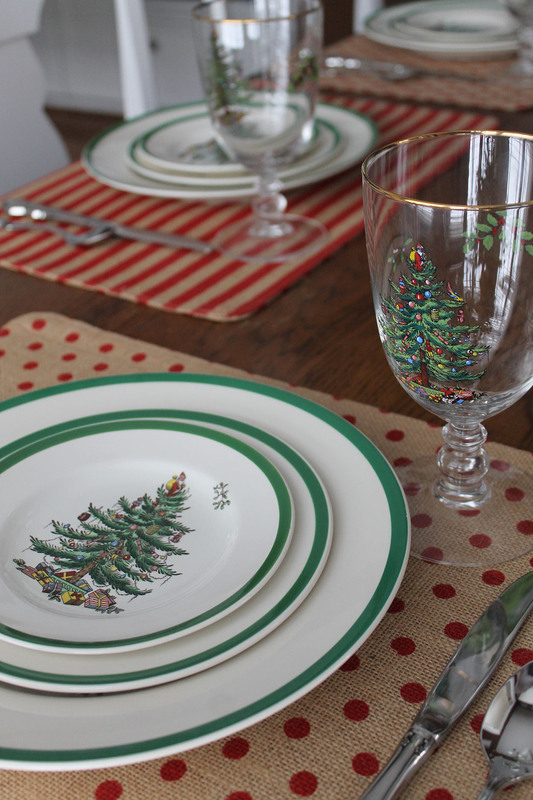 Our Spode Christmas dishes are perfect with them! 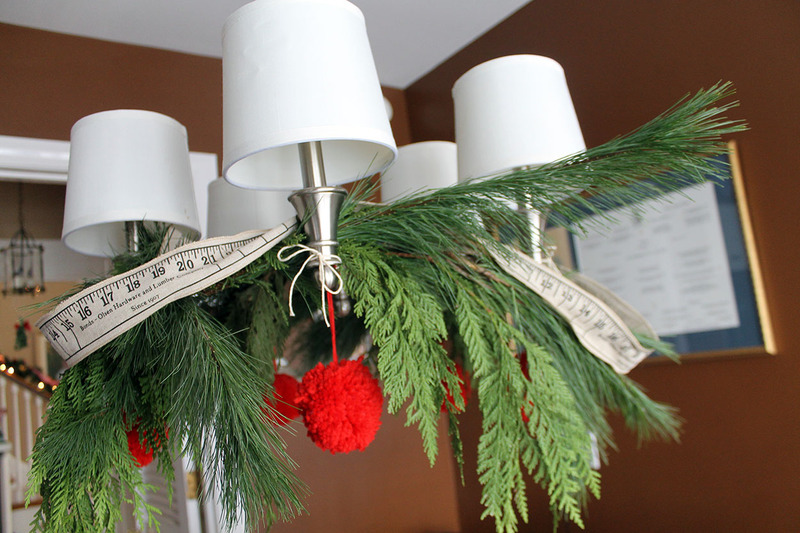 As with the other chandeliers in the house, I added some fresh cedar and pine garland to the kitchen light fixture. 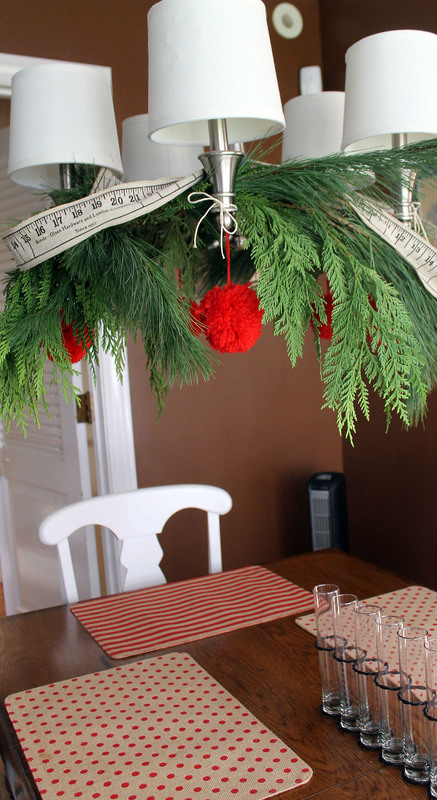 I thought the red pompoms and ruler ribbon were just perfect with the placemats on the table. 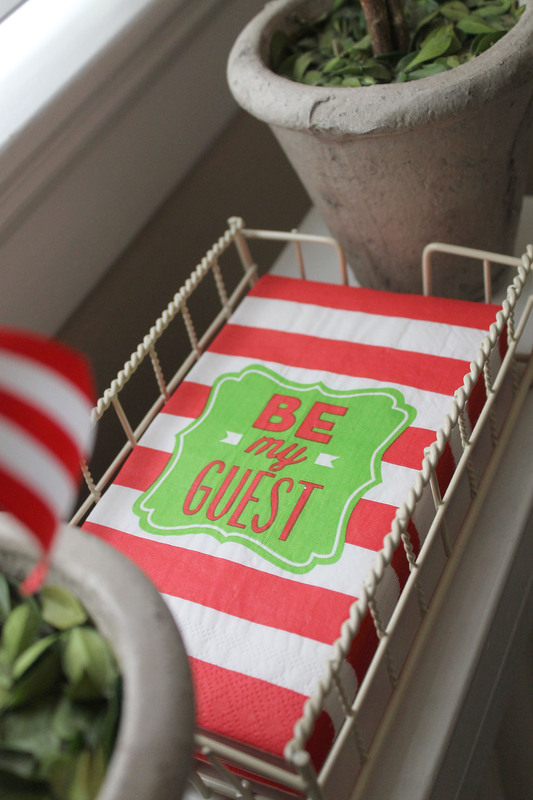 Now you thought I was just showing you around the kitchen today…surprise, I’m also taking you to our guest bathroom. 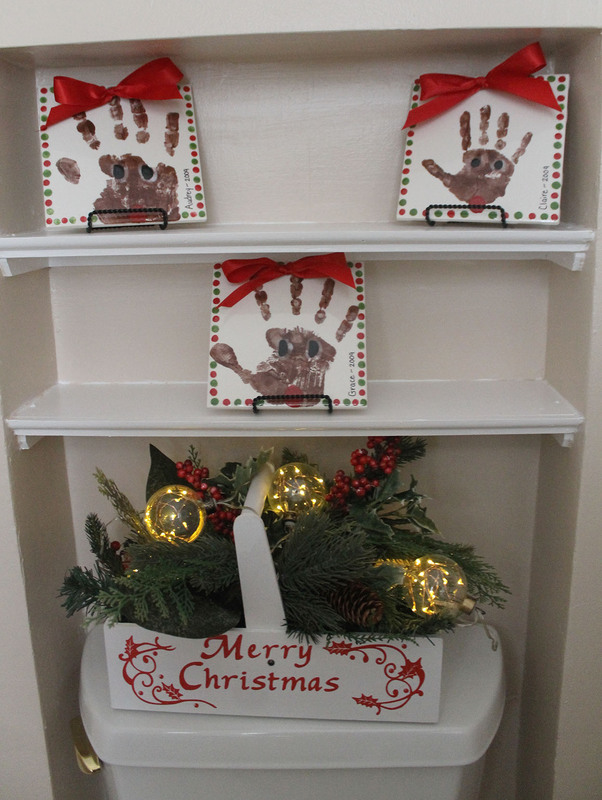 We have these small shelves on one of the walls, and I love displaying pictures and the such on them. 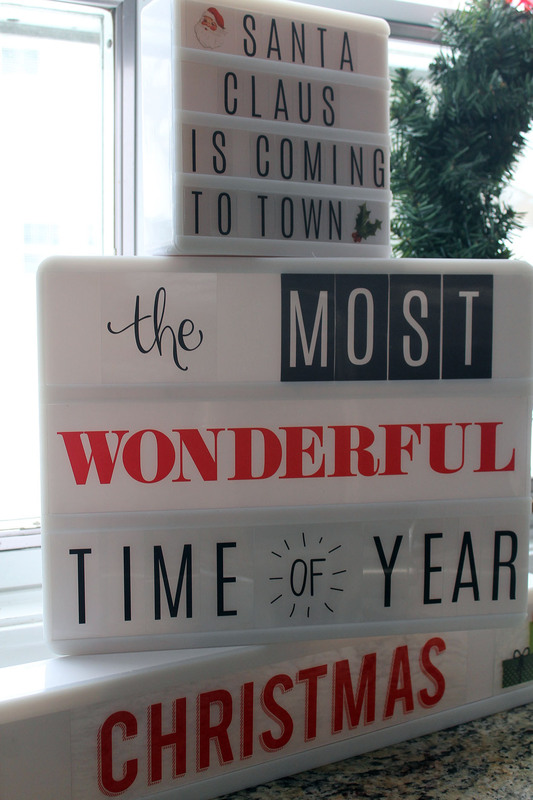 During the holidays, I switch out the decor. 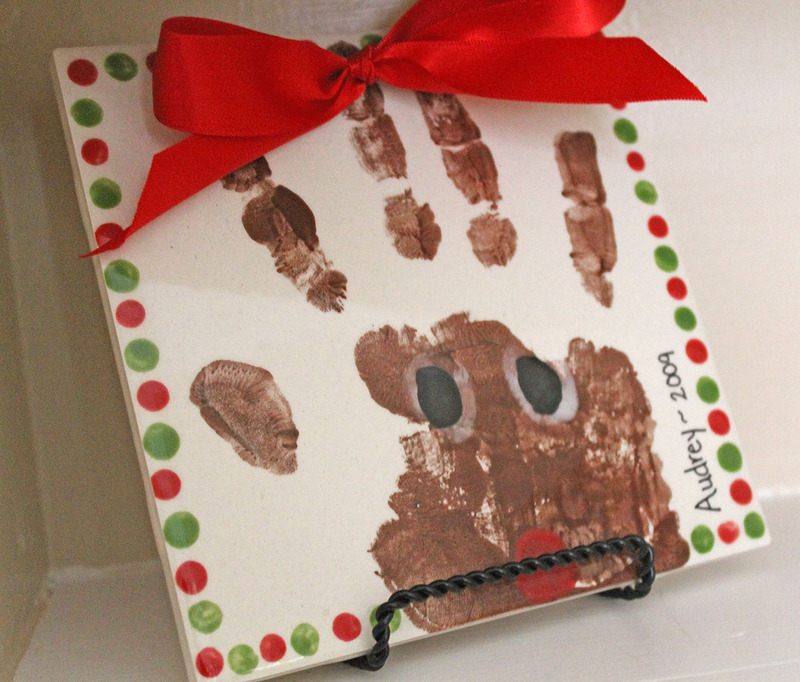 This year, I am displaying these fun reindeer tiles that my daughters made a few years ago. 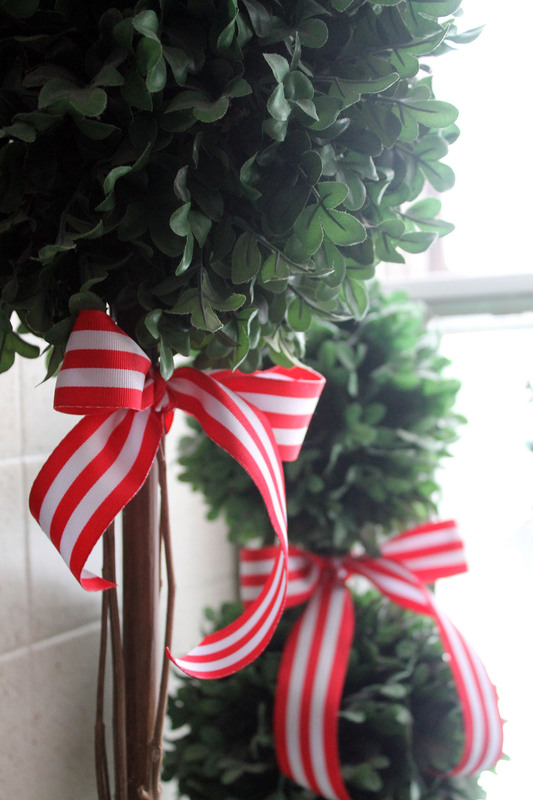 And more of that red striped ribbon! 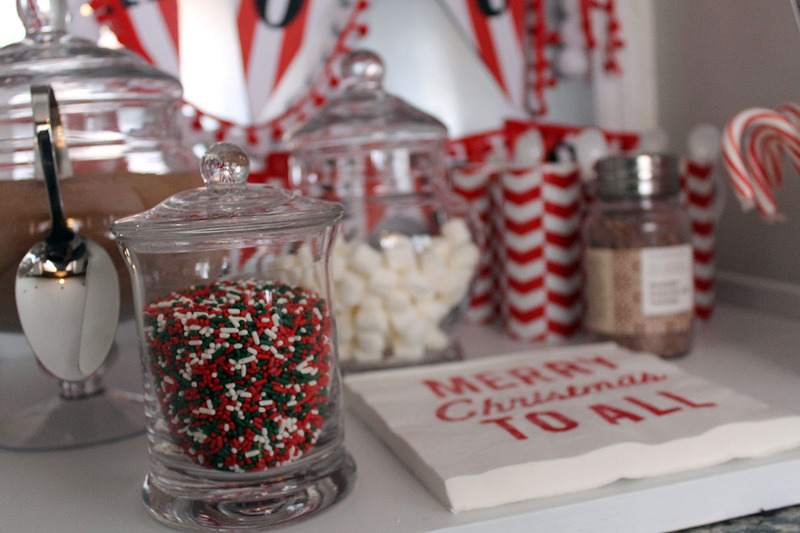 Hope you join me again tomorrow for the last day of my holiday home tour…the living room! 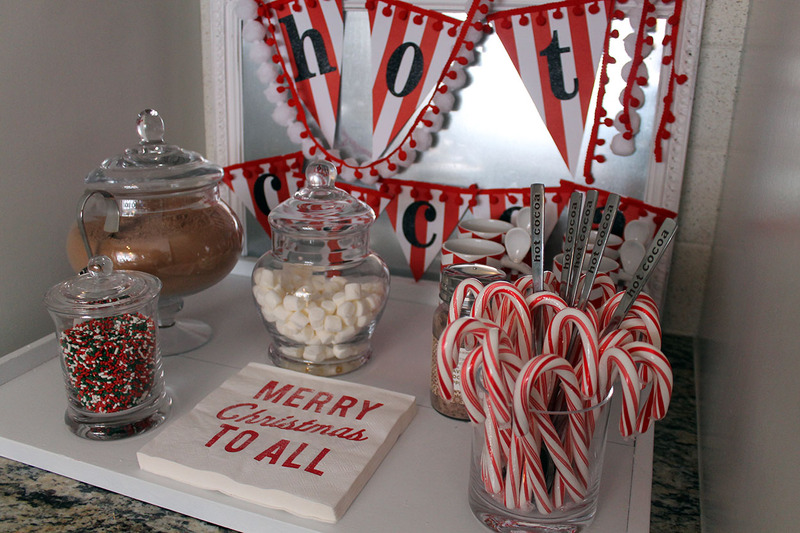 I LOVE the hot chocolate bar! What a great idea!! Thank you for opening your home up to us! It’s been quite the hit with our cold weather here!